It didn’t take long for the 16 shares of Freddie Mac (FRE) that I still own with Scottrade to reach the worthless price. I could have sold my position when the stock was at something around $1.50 the first thing in the morning, but that wouldn’t save me anything since I bought those shares at $6.26 apiece. 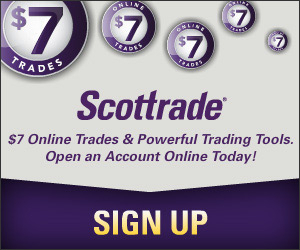 And Paying $7 (Scottrade commission) just to get $24 back? It doesn’t make too much sense. With the $101 I made last week, I am glad I break even on this. For that 16 shares I still have, I am going to just let them be for whatever in coming months and years. BTW, the seizure of both Fannie and Freddie isn’t really a bad thing. In fact, the move by the government was welcomed around the world and was greeted by the street with cheers. The Dow finished the trading session with a 290-point advance. if the companies were left alone without instead of being bailed out, the result could be devastating. And according to Bankrate.com, the 30-year fixed rate mortgage dropped 0.5% to around 6.0% APR, the lowest in 5 months. For the record, today’s closing price of FRE is $0.88 (-82.75%) and FNM $0.73 (-89.63%).